The patient, a lovely vibrant woman in her golden age, had been long searching for an alternative that would remove her dead (root canaled) front (anterior) tooth and replace it with something healthier, while bringing her smile back to life at the same time. After some unhappy dental work from the past and unimpressive dental consultati0ons she decided to seek out a top biological dentist in Greater New York area and found Dr. Yuriy May in Farmington, Connecticut. Her prior consultation had proposed to re-root canal the infected root canaled anterior tooth #9 (something our practice would not recommend!) and when the patient inquired about extraction of the root canaled tooth #9, the other dentists had proposed a titanium dental implant on the extraction site #9, (something our practice would never recommend esthetically or health wise!). If you read about zirconia vs titanium dental implant you’ll quickly understand why its almost never recommended to use a titanium implant for a single anterior tooth replacement. Part of the reason is terrible esthetics in the anterior “esthetic smile zone” which is where the gingival tissue (buccally) tends to be very thin and so the grey metal show through can be very ugly. Dr. May has had many patients who have removed their anterior titanium implants becuase of the “grey shadow effect” showing through the gum, which is very unsightly. Luckily, our lovely patient avoided major pitfalls of all prior dentists by finding Dr. May, a true zirconia implant dental expert who also happens to be one the leading smile makeover dentists in Connecticut and New York. Our patient found Dr. May and chose him for her dental work because he checked all the boxes: he was a top biological dentist in the USA, an expert in cosmetic dentistry, porcelain veneers, zirconia dental implants, Platelet Rich Fibrin autologous bone grafting and of course ozone therapy. After her treatment was completed, she happily reminisced during her final photo shoot, that she knew Dr. May was “the one” she had needed to see but took decades to find. After looking at her before and after photos, its clear this was the optimal treatment for her clinically or esthetically than the one Dr. May recommended and executed beautifully. The patient had a root canal performed on number #9 over a decade ago, and a poorly fitted crown on tooth #8 (both anterior incisors), which had degraded her smile and caused her concern about the esthetics. The root canal also had started to give way to some gingival recession in the esthetic zone, right above the anterior tooth. The otherwise young and vibrant patient was exceptionally youthful and beautiful for her age, except when it came to her smile, which required a bit of love from the hands of skilled biological dentist like Dr. May who also was a talented and infamous cosmetic dentist. Importantly, she had long been searching for a holistic dentist that would be able to address her infected root canal on her anterior incisor, #9, which at the time of becoming a patient had a periapical lesion. Dr. May treatment planned tooth #9 for extraction with ozone irrigation and PRF grafting with delayed zirconia implant placement. Typically, when placing ceramic dental implants in the anterior zone, Dr. May often places immediate zirconia dental implants, same day as extraction, but due to the infection, this case required delayed placement of the ceramic dental implant. Dr. May insisted that he was going to be able to achieve a perfect match for her front 2 crowns and the lateral incisor veneers that he felt she didn’t need to do anything more than the 4 teeth to complete a full and perfect natural smile makeover. This was a risky method, as mosts dentist recommend at least 8 upper veneers/crowns but Dr. May was so convinced she had beautiful teeth that he didn’t want to prepare and ruin if he could instead (and he believed he could, as the best cosmetic dentist) match her tooth perfectly. 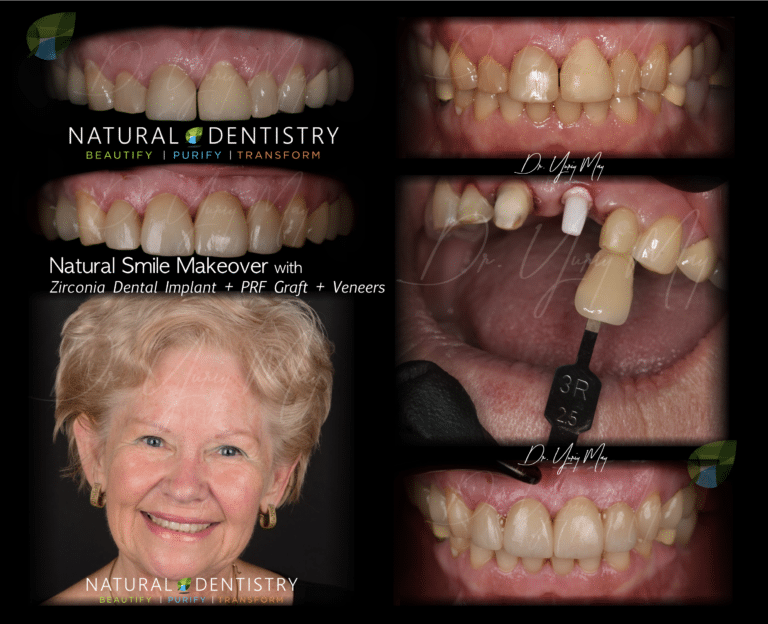 Dr. May went through the painstaking process of PERFECTLY matching her 1 central incisor (the hardest, by far, task to do in cosmetic dentistry, ask any dentist) that was implant supported to the natural prepped tooth central incisor. He worked with a lab and spent hours on the phone discussing the case, marking it up on photos in 2 dimensional and 3 dimensional sketches [on and off the computer], capturing color variations and the final crowns were so well done the first time, they were tried in, loved immediately, and bonded in the same day as they were first shown to the patient. No send backs to the labs occurred in this case, so to use a high end golf tournament analogy; “hole in one”! What was the technical difficulty in this case? The natural tooth prep (stump) ready for the anterior crown had very different esthetic and functional properties than the implant supported zirconia abutment which also was going to have a crown put on, and the 2 crowns needed to match PERFECTLY even though their bases (natural tooth stump vs zirconia implant abutment) were very different. Because the tooth foundation of the #8 central incisor was natural tooth structure, the crown would hue more yellow and thus the crown for that tooth needed to have more white hue and sufficient translucency to look natural while also matching the #9 implant supported crowns. Not he other hand, the #9 zirconia implant supported crown needed to have less of white hue so it would be warmed in tone, to prevent having an overly white / bright/ or grey cast as is often the case when an amateur cosmetic dentist works with zirconia dental implants in the esthetic zone. In addition, the #9 implant supported crown has to be slightly more opaque to prevent the bright white abutment from showing through the crown. All of this has to happen while having the 2 crowns look IDENTICAL to the human eye once they have been permanently bonded to their natural tooth and zirconia abutment foundations. Sounds fun, right? Most dentist, don’t go nearly to this level of minutia or nuance when sending their smile makeover cases to the lab but Dr. May drafts every single textural groove, crown translucency, crown color hue, crown brightness gradient and crown refraction layer to make sure patients look PERFECT. Why? Because that is the mission of natural perfection – Dr. May “rebirths” anterior crowns or teeth from nature, the way mother nature had intended them to look, for every patient and every case. After the shape was achieved, the color was tweaked and perfected until the perfect translucency was reached along with warmth and gray undertones to balance the anterior teeth and complete one the most breath taking, life changing and surgically brilliant cases that has been documented to date. Between the removal of an infected tooth canaled tooth (that alone the patient felt better after the infection was removed) and then the complete smile makeover with only 4 affected teeth made our patient over the moon thrilled with the results and her choice to become a patient of Dr. May’s. We have since enjoyed having the patient return to our office regularly and call Dr. May “her secret fountain of youth” and Dr. May graciously accepts the compliments from such a warm and vibrant soul. The patient was so inspired with her beautiful new smile and her improved health, that she did a full photo shoot, and even did a video testomonial for us to help patients like you understand why Dr. May is a not just an option, but THE option that any patient should choose if they want the ultimate biological and esthetic dentistry for themselves and their health. At Natural Dentistry there are no compromises, no short cuts, just pure, unadulterated, hard work, talented mastery of Dr. May and exceptional attention to detail for beautiful smile makeover overs coupled with world class patient service. Anything is possible when the right talent, passion and skill is behind it! We thank her for selecting the ultimate dentist in the industry to save health, her smile and let her continue to shine her beautiful and positivity onto the world. She’s beautiful, healthy and has been and example to all of us of who we want to me when we grow up and found our youth and vitality again!